These two movies received nothing but praises from almost everyone that has watched them. These two superbly gripping tales of warriors help satisfy the thirst for action in all men. The first movie (Braveheart) is directed, produced, and stars Mel Gibson. It's about a Scottish hero who went from being a weeping widower to a driving force in the revolution to win Scottish independence from England. Action, romance, vengeance - it's got it all. 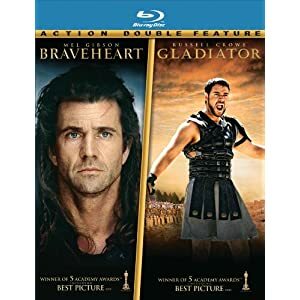 The second movie (Gladiator) is about a brave soldier (portrayed by Russell Crowe) who goes from General to slave in an unfortunate twist of fate. He will have his vengeance in this life or the next. Two movie heavyweights in one pack! Give him the gift of action - buy it now!